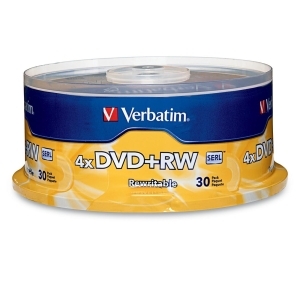 DVD-RW 4.7gb 4x Branded Surface 30 pk spindle This item cannot be shipped to APO/FPO addresses. Please accept our apologies. 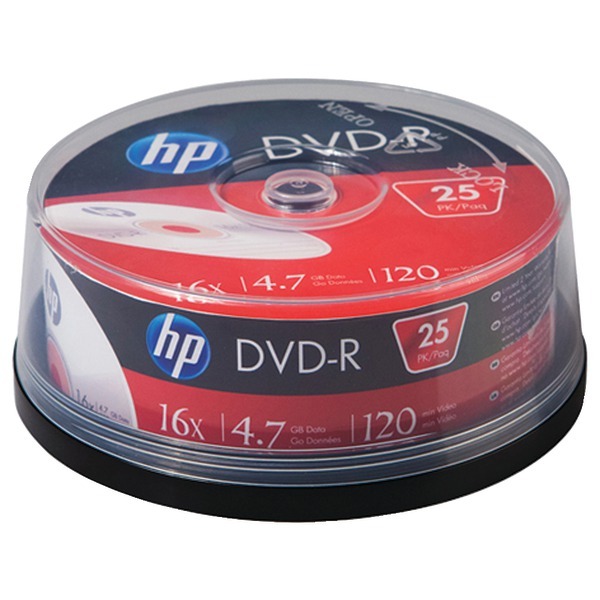 DVD-R 4.7GB 16X BRANDED SURFACE 1PK JEWEL CASE This item cannot be shipped to APO/FPO addresses. Please accept our apologies. 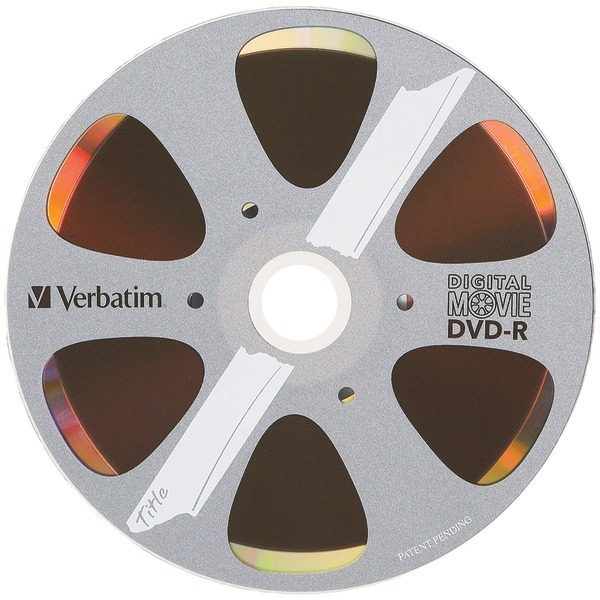 Offers write-once storage capacity, superior recording quality, and compatibility with 1x to 16x DVD+R writers, allowing users to record a complete 4.7GB/120 min disc in approximately five minutes. 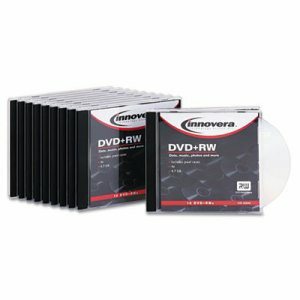 Recognized as the choice for professional users, DVD+R offers the optimal AZO recording dye, which provides the highest level of read/write performance, reliability, and archival life. 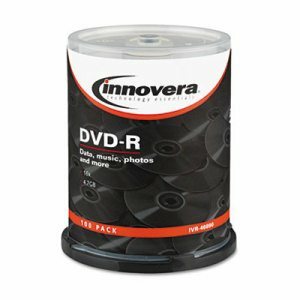 DVD+R media is compatible with hardware from most leading drive manufacturers. Disk Type: DVD+R; Recordable Format: �Write Once� format�may not be altered once data is written to the disc. ; Capacity Range (Data): 4.7 GB; Maximum Recording Speed: 16x. CD-R media is tested and certified by leading drive manufacturers. These high-grade discs deliver reliable recording even at blazing drive speeds, completing a full 700MB/80min recording in less than two minutes. Combining this level of performance and excellent reliability, CD-R media are the ideal storage medium for recording and sharing any combination of digital images, music, desktop files and more. Disk Type: CD-R; Recordable Format: �Write Once� format�may not be altered once data is written to the disc. 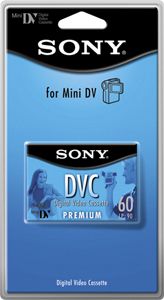 ; Capacity Range (Data): 800 MB; Maximum Recording Speed: 52x. Preserve files and memorable moments, or share them with business associates, friends, and family. High-speed recording allows discs to be burned quickly and efficiently. Large capacity is ideal for personal videos, multimedia presentations, archival backups, digital image storage, and more. Enjoy secure, unalterable data storage with write-once format. Superior archival life ensures performance for years to come. Read compatible with DVD playback devices for easy sharing. Disk Type: DVD-R; Capacity (Video): 120 min; Recordable Format: �Write Once� format�may not be altered once data is written to the disc. ; Capacity Range (Data): 4.7 GB. 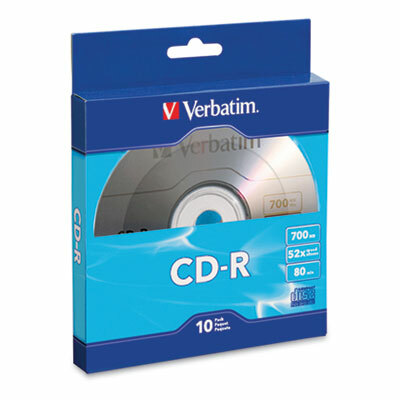 Removable, two-sided storage sleeve holds two CDs or one CD with liner. Made of clear polypropylene to prevent scratching the disc surface. Punched to fit standard ring binders. 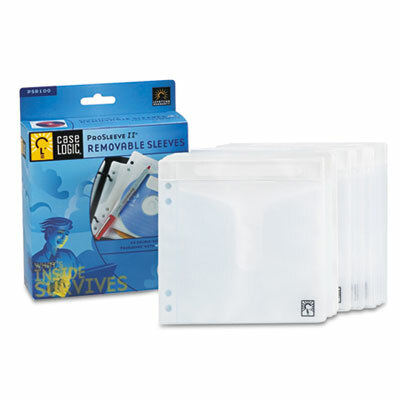 Media Sleeve Type: Double-Sided Sleeve; Media Stored: CD; DVD; Capacity (text): 2; Material(s): Polypropylene. 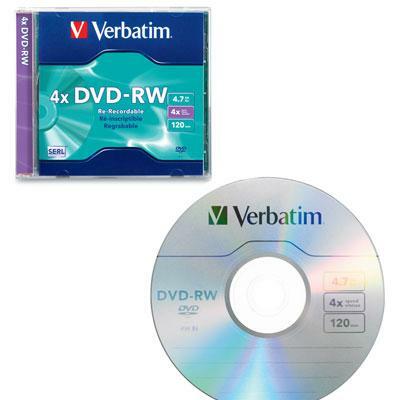 DVD+RW DataLifePlus 1-Pack in Jewel: 4.7GB Write & Rewrite at 1X to 4X speeds - DVD+RW media is designed to achieve excellent compatibility with current and future DVD drives and video players. Branded disc surface in DVD jewel case. This item cannot be shipped to APO/FPO addresses. Please accept our apologies. 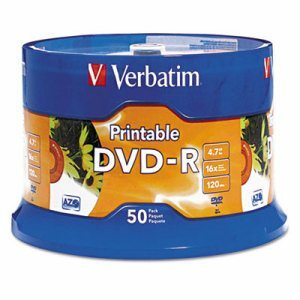 Rewritable disc offers incredible flexibility and convenience. Leave disc open to add data, or close it to make data permanent for flexible data management. High capacity makes it the ideal media for use in graphics and advertising, software development, video recording, and more. Durable disc can be rewritten up 1,000 times. Easy to write on surface for quick, clear labeling. Includes durable jewel case to protect disc when not in use. 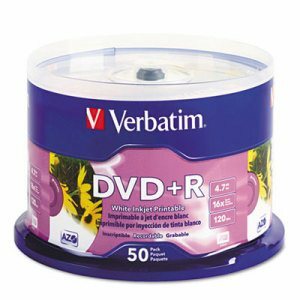 Disk Type: DVD-RW; Capacity (Video): 120 min; Recordable Format: Rewritable format�may record and re-record data up to 1,000 times. ; Capacity Range (Data): 4.7 GB. Large storage capacity is ideal for hard drive back-ups, digital images, videos, and more. Write-once format protects important files from erasure and overwrites. 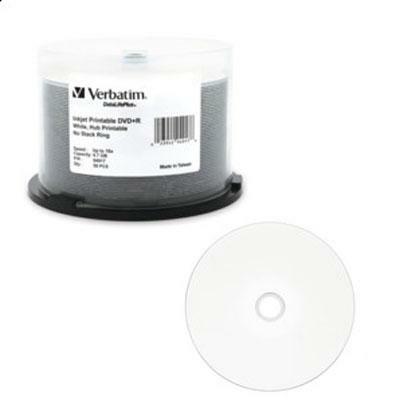 Easy to write on smooth surface provides quicker disc labeling. Disk Type: DVD-R; Capacity (Video): 120 min; Recordable Format: �Write Once� format�may not be altered once data is written to the disc. ; Capacity Range (Data): 4.7 GB. 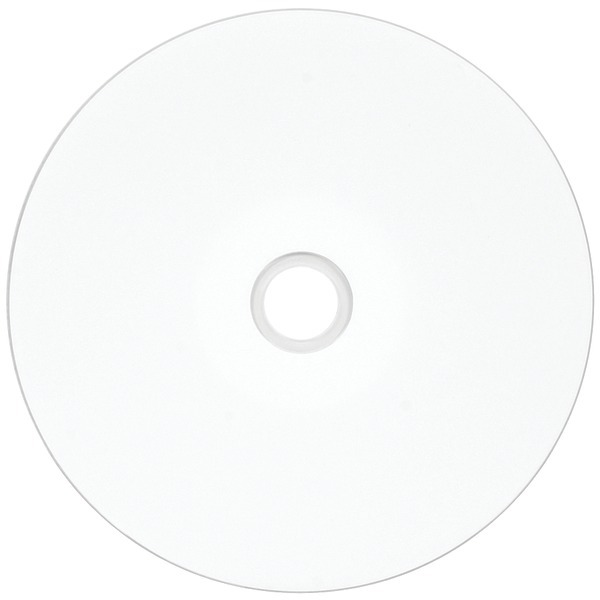 Print directly onto the disc for quick, convenient labeling. Create custom labels to personalize your media. Use for long-term data storage, movies, and more�large storage capacity accommodates all types of files. Write-once format protects data from overwrites and erasures. Convenient spindle keeps all your DVDs organized in one location. Disk Type: DVD-R; Capacity (Video): 120 min; Recordable Format: �Write Once� format�may not be altered once data is written to the disc. ; Capacity Range (Data): 4.7 GB. 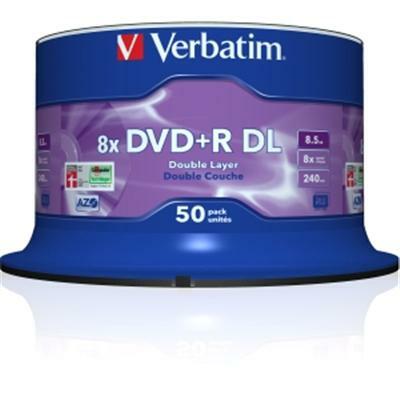 DVD+R Double Layer and DVD-R Dual Layer discs can hold up to 8.5GB double the capcity of a standard DVD or approximately 4 hours of DVD-quality video on a single disc and 16 hours of VHS quality. 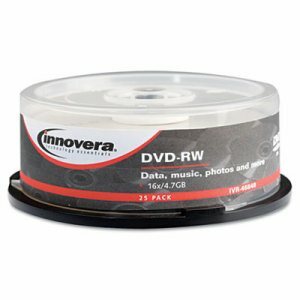 Compatible with double-layer writers from leading manufacturers these discs are ideal for archiving home movies. 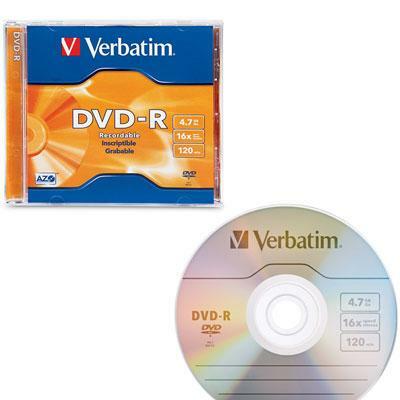 DVD+R DL and DVD-R DL are one-time record discs ensuring that your movies video clips or other data will not be erased. 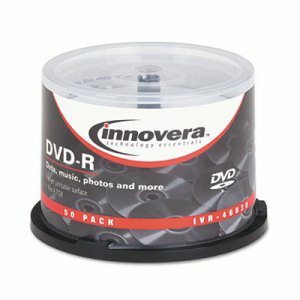 While requiring a dual-layer recorder these discs are compatible for playback with most standard DVD video players and DVD-ROM drives. No need to flip the disc records 8.5GB on one side. Supported by high speed Double Layer writers up to 10X burn 8.5GB in approximately 12-15 minutes. 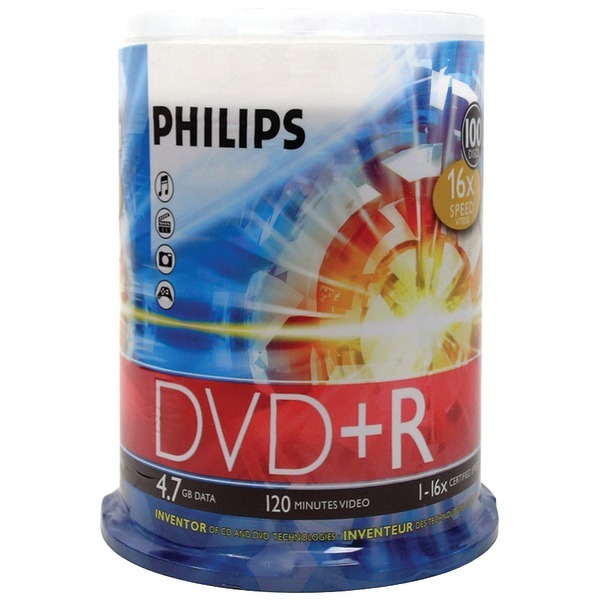 Compatible with DVD+R DL drives from Sony Philips Lite On and other leading manufacturers. Ideal for archiving home movies. Limited Lifetime Warranty. This item cannot be shipped to APO/FPO addresses. Please accept our apologies. Large storage capacity is ideal for hard drive back-ups, digital images, videos, and more. Write-once format protects important files from erasure and overwrites. 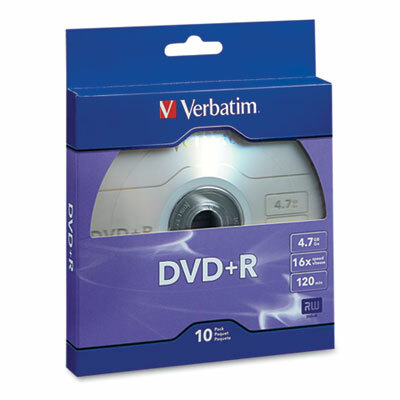 Compatible with more DVD devices than standard DVD-R discs. 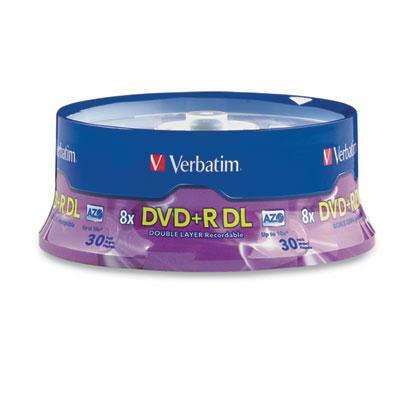 Easy to write on smooth surface provides quicker disc labeling. Disk Type: DVD+R; Capacity (Video): 120 min; Recordable Format: �Write Once� format�may not be altered once data is written to the disc. ; Capacity Range (Data): 4.7 GB. 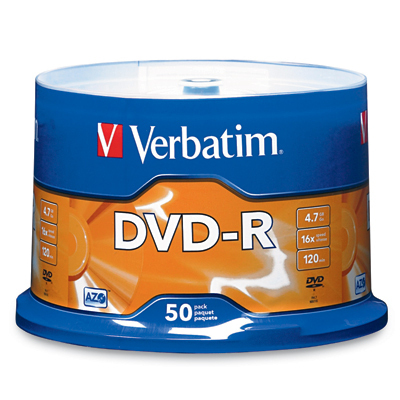 Offers write-once storage capacity, superior recording quality, and compatibility with 1x to 16x DVD+R writers, allowing users to record a complete 4.7GB/120 min disc in approximately five minutes. Recognized as the choice for professional users, DVD+R offers the optimal AZO recording dye, which provides the highest level of read/write performance, reliability, and archival life. 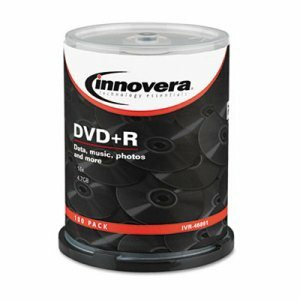 DVD+R media is compatible with hardware from most leading drive manufacturers. Disk Type: DVD+R; Capacity (Video): 120 min; Recordable Format: �Write Once� format�may not be altered once data is written to the disc. ; Capacity Range (Data): 4.7 GB. Efficient, reliable storage. High-capacity disc is perfect for movies, videos and more. Permanent write-once format. Disk Type: DVD-R; Capacity (Video): 120 min; Recordable Format: �Write Once� format�may not be altered once data is written to the disc. ; Capacity Range (Data): 4.7 GB. 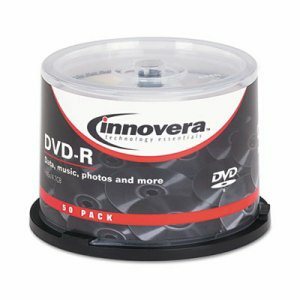 Ideal disc for storing video, music, and other multimedia files. Advanced azo dye recording layer offers superior recording quality and longer archival life. High storage capacity is great for backing up computers or making DVD movies to share with friend and family. 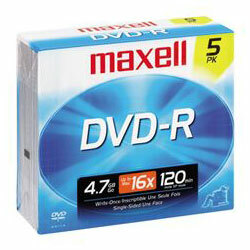 Read compatible with most DVD-ROM drives and DVD players for added convenience. Permanent, write-once format protects important content from erasure and overwriting. Disk Type: DVD+R; Capacity (Video): 120 min; Recordable Format: �Write Once� format�may not be altered once data is written to the disc. ; Capacity Range (Data): 4.7 GB. 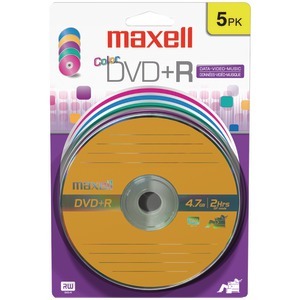 DVD-RW 4.7gb 4x branded surface 1pk jewel case This item cannot be shipped to APO/FPO addresses. Please accept our apologies. 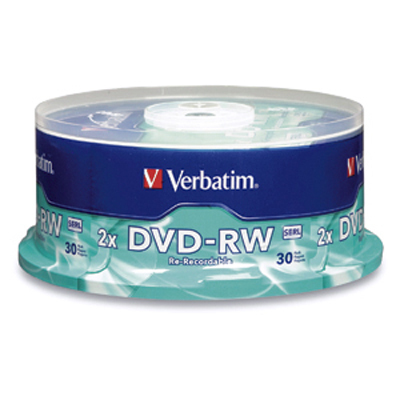 Rewritable disc offers incredible flexibility and convenience. 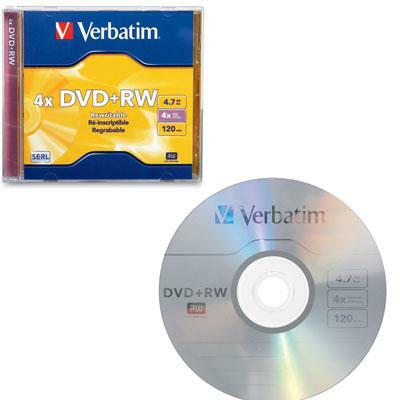 DVD+RW technology allows users to record, read and erase on the same disc. High capacity makes it the ideal media for use in graphics and advertising, software development, video recording, and more. Durable disc can be rewritten up 1,000 times. Easy to write on surface for quick, clear labeling. Includes durable jewel case to protect disc when not in use. 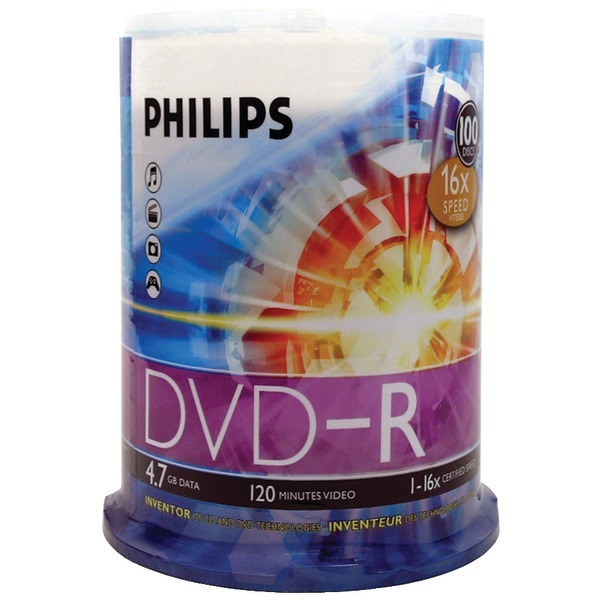 Disk Type: DVD+RW; Capacity (Video): 120 min; Recordable Format: Rewritable format�may record and re-record data up to 1,000 times. ; Capacity Range (Data): 4.7 GB.